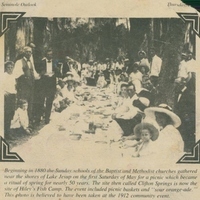 A Sunday school picnic at Clifton Springs located near Lake Jesup in Oviedo, Florida. Although the caption states that the photograph was likely take around 1912, the precise date has been determined to be November 12, 1910. Some of the individuals appearing in the photograph are J. C. Brainan, J. H. Lee, Olauc Howard-Huret, Frank Anderson, Sid Brown and his wife, H. B. McCall, and Hugh White. Clifton Springs was named in honor of the hometown of Dr. Henry Foster, a wealthy grower from Lake Charm in Oviedo. Originally called White's Wharf, the site marks the approximate location where John Bartram and William Bartram camped during their excursion along the St. Johns River in 1765-1766. William G. White migrated to the area in the late 1870s and built a store here in 1879. White moved his store to Orlando in the 1880s. Many Oviedo residents used the site as the location for their annual May picnics, which began in 1880. The picnics were hosted by a joint committee of the local Baptist and Methodist churches. The wharf is now known as Hiley's Fish Camp. Original black and white newspaper photograph: The Seminole Outlook: Private Collection of Bettye Reagan. "Church Picnic by Bettye Reagan." RICHES of Central Florida. https://richesmi.cah.ucf.edu/omeka2/items/show/6931. Digital reproduction of original black and white newspaper photograph: The Seminole Outlook. "Sunday School Picnic at White's Wharf." RICHES of Central Florida. https://richesmi.cah.ucf.edu/omeka2/items/show/5639. Originally published by The Seminole Outlook. Copyright to this resource is held by The Seminole Outlook and is provided here by RICHES of Central Florida for educational purposes only. "WHITE'S WHARF (Clifton Springs)." Waymarking. http://www.waymarking.com/waymarks/WMH53_WHITES_WHARF_Clifton_Springs. Reagan, Bettye Jean Aulin. 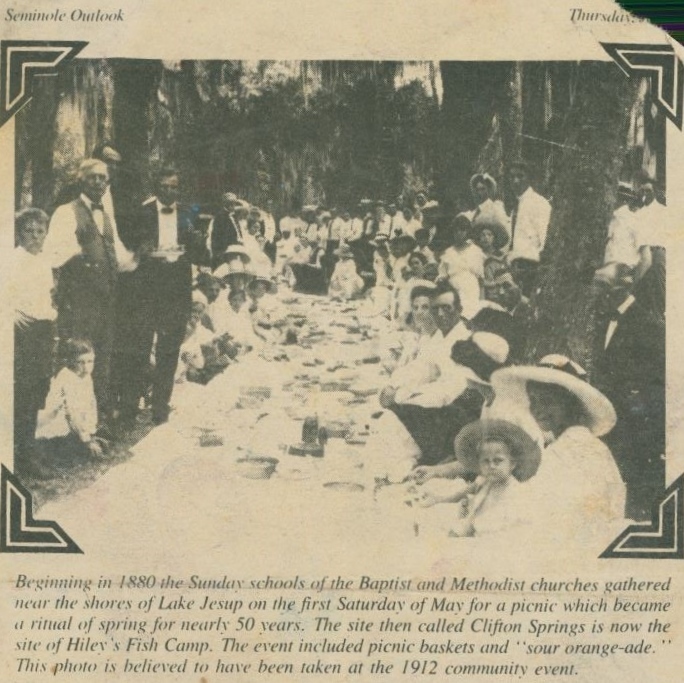 “Sunday School Picnic at Clifton Springs.” RICHES of Central Florida accessed April 18, 2019, https://richesmi.cah.ucf.edu/omeka/items/show/6353.